McLaren's Lewis Hamilton says it was a great feeling to be back driving again after a solid first two free practice sessions for the Japanese Grand Prix. 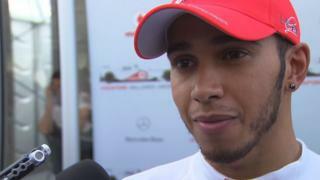 Having recently ended speculation about his future by announcing he is to leave McLaren and join Mercedes in 2013, Hamilton was happy to be back in the car at the "phenomenal" Suzuka circuit. Hamilton was second fastest in practice two, just behind Mark Webber, and predicts a tough battle with the Red Bulls over the weekend. Hamilton's current team-mate Jenson Button was fastest in practice one, and says the team concentrated on set-up work in the second session in which he finished seventh. Button will take a five-place grid penalty for Sunday's race after having to change his gearbox following the Singapore Grand Prix.